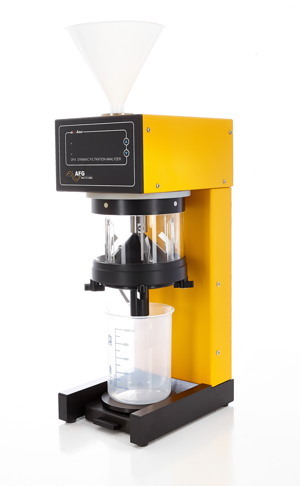 It determines quickly and accurately the influence of chemicals on the filtration characteristics of fiber suspensions by an automatic analysis of drainage and retention. The DFA is operated by a PC. The user-friendly software controls the measurement and allows a sophisticated analysis and reporting of all results. In order to simulate different process conditions, all relevant data to configure a mixing profile is stored and used for automatic measurements. The user selects a mixing profile or sets all relevant mixing parameters before starting the measurement. After that the DFA stirring chamber fills with the fiber suspension. The selected set mixing profile starts to stir the suspension as per set parameters. A dosage of chemical additives during the stirring process is possible to influence the drainage and retention process. Thru the use of audible prompts the user is notified when to introduce any chemicals. A valve opens automatically when the mixing process is finished. Filtration through selected screen starts immediately. Filtrate is continuously measured with approximately 5 sample points per second. The quantity of filtrate is shown on a graph as a function of time. The computer software allows displaying different graphs, comparing results, adding all kinds of parameters to graphs or creating comparable graphs. E.g. the quantity of dosed chemicals can be compared to the dehydration velocity. The export of all measurement data into an EXCEL-spread sheet for further analysis and data storage is possible. The instrument also has an integrated pH-measurement. filter remains clean by the mixing gear. The user has to enter the filler content or the overall solid content of the filtrate and the sample in the PC and get the total or filler retention by the DFA software. The SCAN-test method describes the procedure for determining the fines content of all kinds of pulp by means of a single-screen fibre classifier.